A diving bell has returned to port as bad weather does not allow it to be used. The diving bell is to be used in the search for bodies on the sunken ferry Sewol. The desperate search and rescue operation continues into the 10th day from the accident with the death toll now at 187. A 'Diving Bell' is a bell-like metal structure that is submerged up to 40 meters to create a air-filled space for divers for rest and resupply. The boy who first raised the alarm that the South Korean ferry was sinking did not have time to call his parents, his father said, and was found dead not wearing a life jacket. His father said: "If only he had been wearing a life jacket, I wouldn't be this heartbroken... He didn't have time to call his mum and dad... He reported it to 911 (emergency number) and he's back now. I am so proud of him." All 15 crew members involved in the navigation of the sunken South Korean ferry are being held after four more people were detained, the Associated Press reports. Two members of the steering crew and two helmsmen were arrested today joining 11 others, including the ship's captain, who were previously detained. They are accused of negligence and failing to help passengers in need as the ferry sank on April 16. Some 187 bodies have been recovered from the vessel while 115 people remain missing. Divers retrieving bodies from the submerged South Korean ferry discovered 48 female students wearing lifejackets in a room on the ship built to hold 30, CNN reported. Most of the victims on the Sewol ferry were high school children, who were told to stay where they were for their own safety and were trapped. So far, 185 bodies have been recovered from the ship, which is 240 feet below the surface, and 117 people remain missing. Rescuers saved 174 people on April 16, the day the vessel sank on a trip from the port of Incheon, near Seoul, to the southern holiday island of Jeju. Life rafts and escape chutes on a sister ship to the sunken Sewol ferry have been found to not work properly, the Reuters news agency has reported investigators as saying. More than 300 people, most of them students and teachers from the Danwon High School near Seoul, are dead or missing presumed dead after the April 16 disaster. The confirmed death toll currently stands at 181. The family that has a major stake in companies controlling the operator of the capsized Sewol ferry in South Korea are willing to take "legal and social responsibility" for the incident, its lawyer said. But the lawyer for Yoo Byung-un did not say that the family was assuming liability for what he called a "tragic accident", and said the family had not been summoned by prosecutors. "Yoo and his family will take all legal and social responsibility for this tragic accident if they have to as major stakeholders of the company," the lawyer Son Byoung-gi told Reuters. South Korean investigators have raided the shipping safety watchdog as part of their growing probe into the sinking of the Sewol ferry. "The objective was to investigate malpractices and corruption in the entire shipping industry," said Song In-taek, head deputy chief prosecutor at Incheon District Prosecution Service. A member of crew of a South Korean ferry that sank last week has said she and her colleagues were "under command" to abandon ship, the Reuters news agency reports. The unidentified crew member, speaking briefly to reporters on the way from court back into detention, was speaking behind a surgical mask and wearing a baseball cap with a jacket hood, the agency said. The Sewol, weighing almost 7,000 tons, sank on a routine trip from the port of Incheon, near Seoul, to the southern holiday island of Jeju. Investigations are focused on human error and mechanical failure. A South Korean boy who first raised the alarm about the sinking Sewol ferry has been found drowned, his parents believe. Reuters news agency reports that the boy's parents had seen his body and clothes and concluded he was their son, but he has not been formally identified with a DNA test. 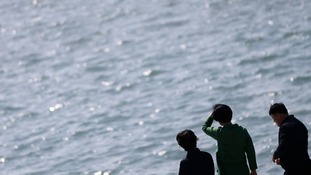 It's being reported the body of Korean boy who first rang emergency services to say ferry was sinking is found. Parents believe it's him. The boy's family name is Choi. His call came 3 minutes before anyone from the crew of #Sewol rang for help. He has been missing for a week.